Registry Booster 2012 is a Microsoft Gold Certified partner. You don’t get that kind of partnership without providing high quality products for Windows year after year. 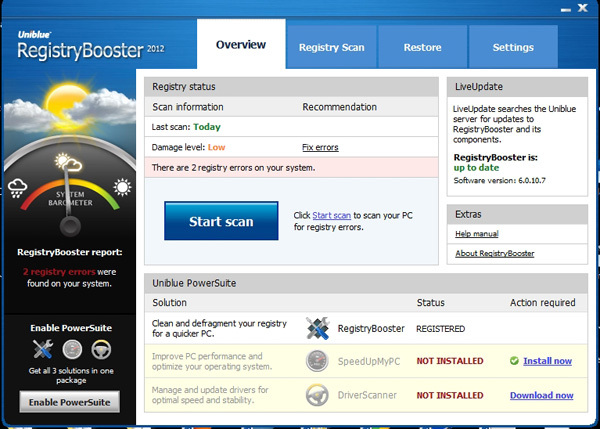 With over 100 5 star awards it’s no wonder Registry Booster made our top 3 list for the best registry cleaner out there. 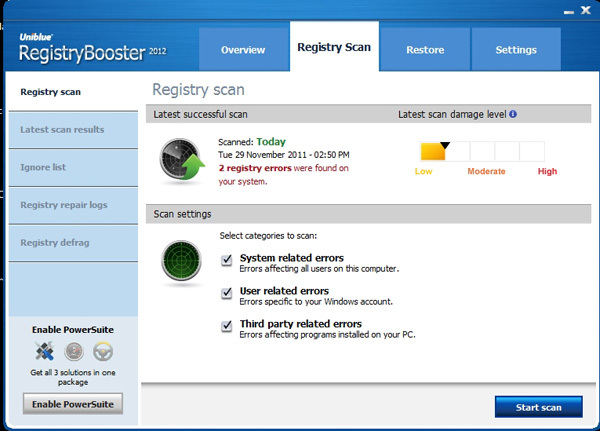 Registry Booster has to be one of the easiest ways to fix issues with the Windows registry. This award winning registry cleaner starts by conducting a deep scan of your registry, checking for file extension errors and other registry conflicts. Then makes the needed repairs and adjustments. 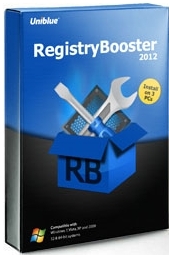 You must purchase the Registry Booster 2012 full version in order to receive all the features listed above. The evaluation will scan your computer for registry errors. If you use numerous programs at times you’ll need to remove them to save disk space, update an older version of the software or install new programs. All these changes can negatively impact how Windows operates with devastating results: system crashes, errors or boot up problems. 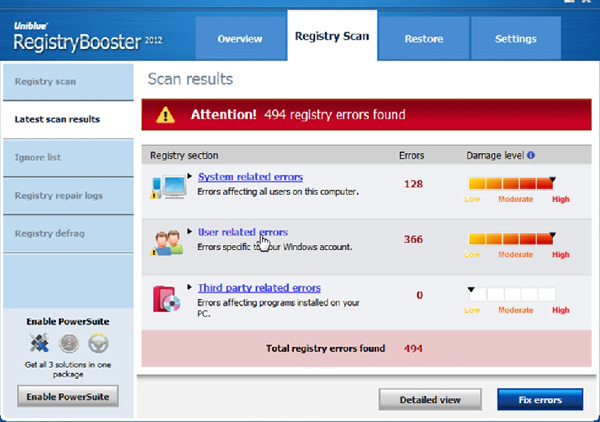 Tools like Registry Booster are handy to help you keep the system clean. The design of the user interface is not only colorful, but setup in a tab formatted, where each tab is used to hone in all a section of the computer or Windows. In the below image we show the results after a registry scan. You have the option of drilling down into all three categories to view more in-depth information about the specific errors. For most non savvy computer users or those who don’t really care and just want the problems resolved you can simply click the Fix Errors button. This is what I normally do unless I’m troubleshooting a specific issue. In the settings tab you can control how when you want Registry Booster to run. You can schedule a daily scan, weekly scan, every other month or every month. You can also have Registry Booster launch when your computer turns on and even do an auto scan. Personally I disable the Launch Registry Booster option when Windows starts and I schedule an automatic scan once every two weeks. The only time’s I scan more often is when I encounter a registry error and need it resolved then and there. Under the Registry Scan tab you can see the last time the scan was run as well as the latest scan results. The Ignore list is there mostly for locked registry files that can not be changed. This option as well as the Registry Repair Logs are made more for computer repair tech’s then anything else. Most people will not have to or want to even dive into these options. The Registry defrag option is a great tool to use to compact your registry. I use it and it only takes a few minutes to do. This helps to boost the access time of windows going through the registry. Not a huge bump in performance but every little bit counts. changes made don’t resolve the issue, the system can be rolled back to the state prior to any fixes. You do not have to worry about backing up the registry as Registry Booster does this automatically for you. If you ever start to encounter issues after a registry cleaning and you are wondering if the registry cleaner is at fault, it’s easy to test things out by doing a roll back. 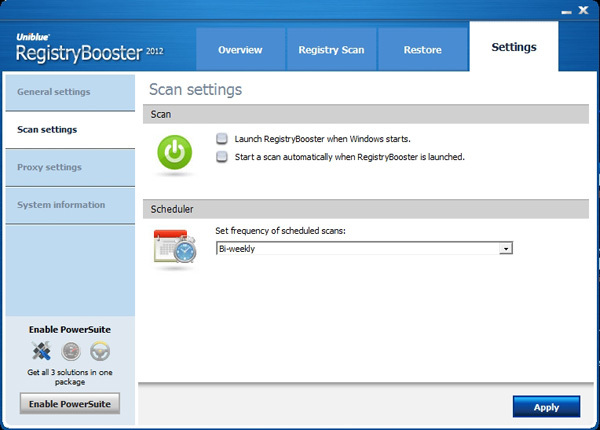 Registry Booster 2012 is very easy to use and will do a great job at cleaning your registry. 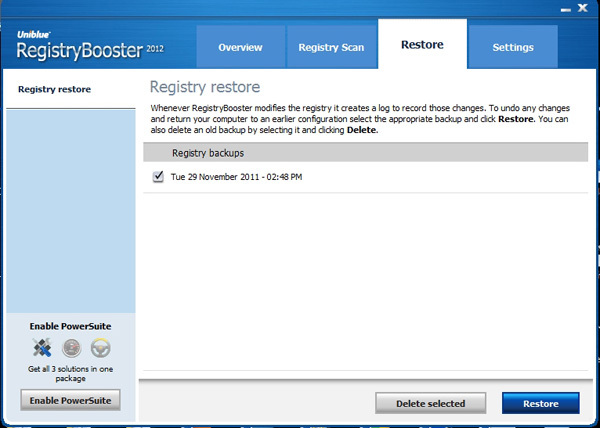 I highly recommend Registry Booster and you will like how simple the interface and the job it will do. My only objection to this program is it’s just a registry cleaner and nothing else. Most other registry cleaners have many other tools in them. If you decide you purchase Registry Booster I would recommend you upgrade to the Power Suite as it gives you many more tools to help you get the most life and speed out of your computer.